How we spend our Christmas each year. 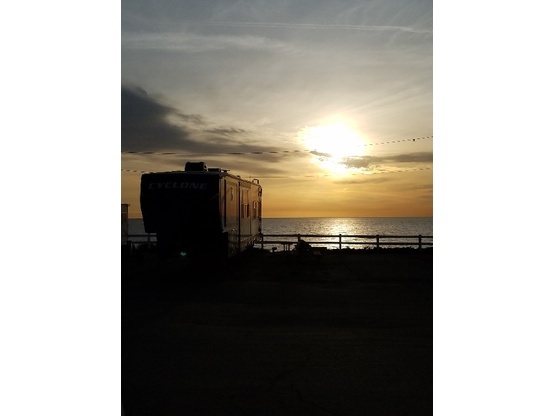 We stay at Camp Pendleton Marine Corps Base overlooking the Pacific Ocean. Enjoying time out at Dumont Dunes in California. Bullet and Denver enjoying Idaho. 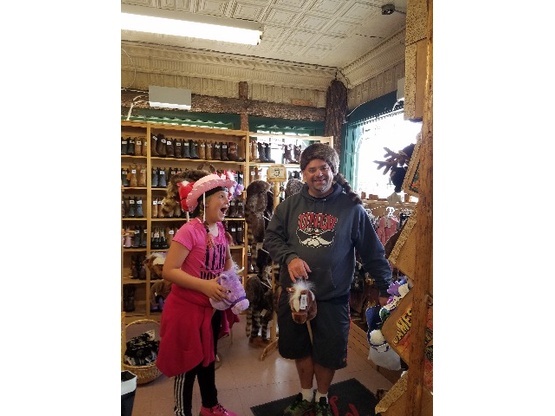 My husband and daughter enjoying the shops in West Yellowstone. 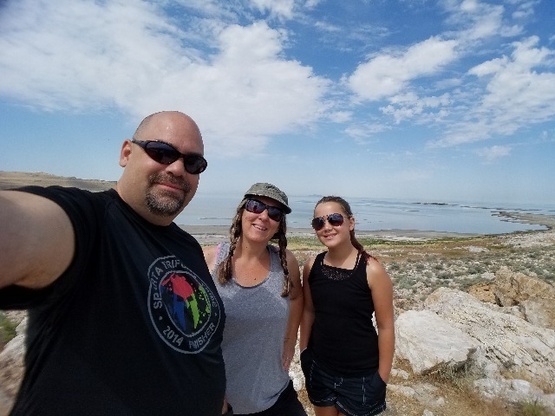 Exploring the Great Salt Lake. I love finding crazy roadside attractions. 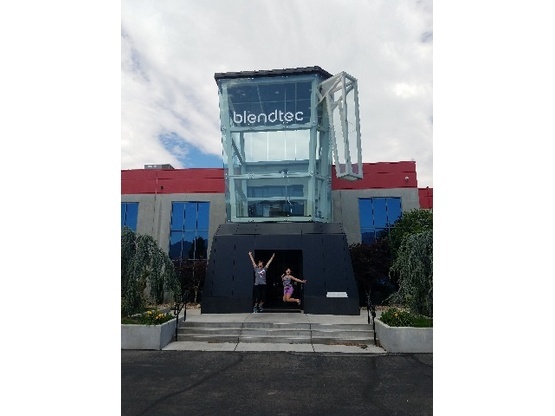 This is the giant blender in Utah. One of our many trips to watch our daughter compete in her favorite sports. We are a family of 3. My husband and I have been married for 17 years and hope to be full timers very soon. Our daughter is 12 years old and getting ready to go into the 8th grade. My husband is a former marine and is currently waiting for me to retire so we can go on our full time adventures. I am a secretary at our local high school and plan to retire in 5 years when our daughter graduates. 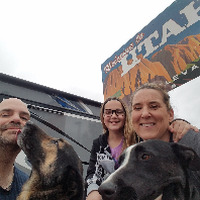 We have just taken up RVing in the last 5 years and try to go on adventures on every school break. We currently travel in the summer, winter and spring breaks and long weekends. 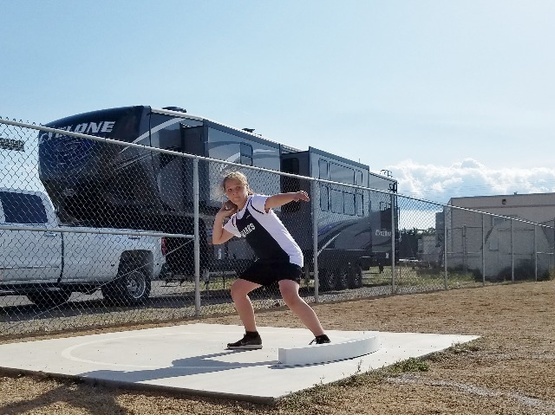 Our daughter is into volleyball and track, so sometimes we are just heading off to a meet or game that may be a few towns over. We want to show our daughter this amazing country before she Graduates,and hope to hit every state with her. My husband works for RV Driving School as an instructor. He is amazing as helping couples learn how to drive together and depend on each others strengths on the road. He always has great tips for those hitting road. Plus he is amazing at parking. Just when I think we wont fit he some how pulls it off. We have 2 dogs that are our extra children. We have Denver who is approximately 8 years old and is a German Shepherd. We also have bullet who is almost 3 years old and is part German Shepherd and part Terrier. 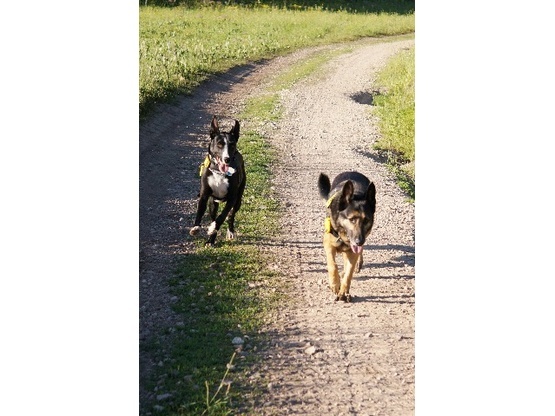 Both are rescue dogs from the German Shepherd Rescue in our area. We have had Denver since he was 3 years old and we have had Bullet since he was 8 weeks old. They would both be considered large dogs although Bullet is more skinny and lanky and Denver is more stocky. Both are under voice and hand signs control. They love other dogs and are fully contained in our trailer. We have a toy hauler so the entire garage area and patio is theirs. They are on a leash at all times if they leave the trailer unless we are at an RV Park with a dog run. They are fully up on their shots and check ups and we always have proof to share with any host. 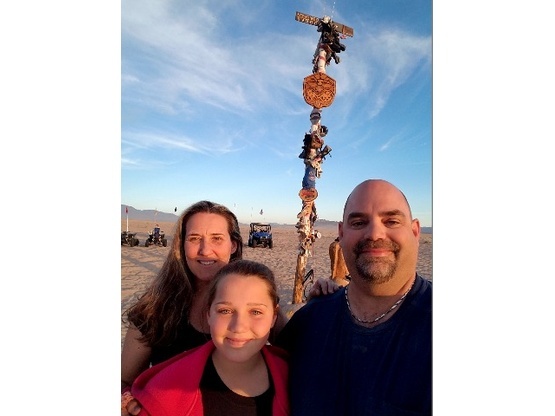 We enjoy going out to Dumont Dunes for Thanksgiving and enjoy time with friends and exploring the dunes. This year will be our first time bookdocking on our vacation. 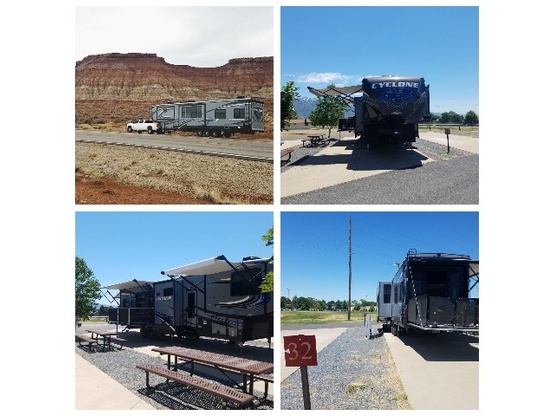 We just upgraded our solar and hope to be able to see places we would have never known about if it was not for boondocking and this sight. We live in Pahrump, Nevada. 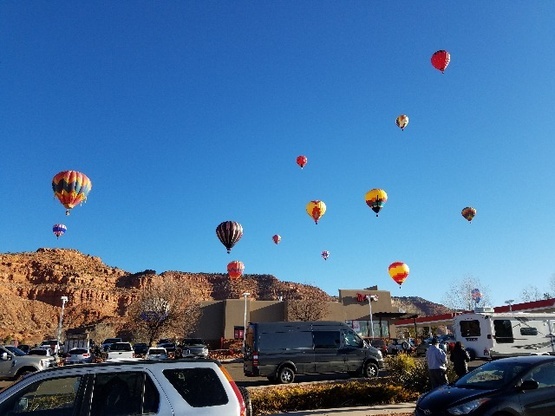 It is located about 45 minutes up in the mountains from Las Vegas. It is actually a very big snow bird town. Our population is about 36,000 permanent residences, but from October to May we boom a bit thanks to all the snowbirds. We are considered a small close knit community. Everyone knows everyone! We have one high school, a Walmart, a Home Depot, a Tractor Supply, and the usual fast food restaurants. It is a great place to own 4x4's as we are surrounded by mountains and BLM land. My husband and I love raising our daughter in a small town. We have a 2017 Cyclone 4250 5th Wheel Toyhauler. It does have 3 slides total. Along with a patio out the back and the side (but those are optional to put out if there is unlimited space). We pull it with a 2015 Chevy Duramax 3500 Dually. We are a self contained unit and do have solar and a generator. Great guests. Welcome back anytime. This great family stayed with us last week. They were fun, appreciative and they would be welcome back any time. Their dogs were well behaved and our dog, Star had fun playing with them. The communication was great and they were very flexible with the route changes that were necessary due to some flooding we had going on in our area. We wish them safe travels.